With this simple template, we can start off conversation for details and define acceptance criteria for confirmation. 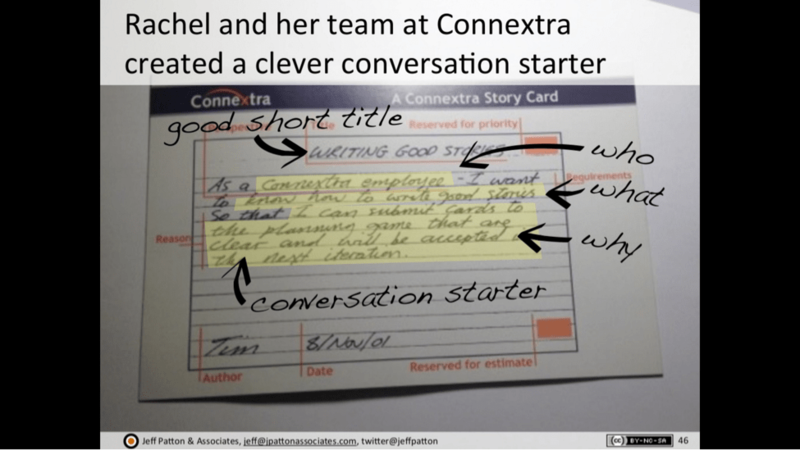 It’s about time to write the acceptance criteria onto the flip side of your user story card. When describing the acceptance criteria, using Gherkin syntax as follows is beneficial both to the user and developer. A user can develop the acceptance criteria in plain English using Gherkin syntax with quite limited keywords, while the developer can incorporate it into the testing framework, such as SpecFlow, Cucumber, Fit/FitNesse, and the like, to automate the testing and documentation work.